Screenshot of the online B.C. Responsible & Problem Gambling Program hosted at www. bcresponsiblegambling.ca. 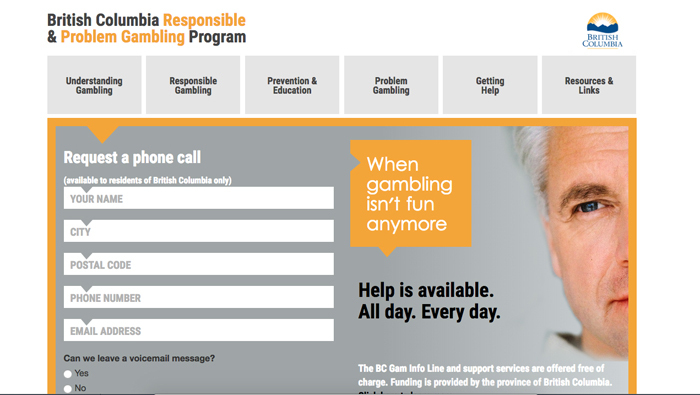 Gulf Islanders who have been affected by problem gambling can access counselling, outreach programs and education through the British Columbia Responsible and Problem Gambling Program. The BCRPGP started more than 20 years ago as part of the addiction services system, but has been operating on its own for 16 years. It is not solely focused on traditional gambling and betting, but has been moving towards looking at new forms of gambling. Online video games, for example, have been incorporating gambling-like activities. Free video games based on phones, online or on social networking sites often include micro-transactions to make revenue. A micro-transaction is a way for players to purchase upgrades or skins for a character to enhance the experience of the game. Even though micro-transactions are not a betting mechanism, they function like gambling in that players are rewarded by spending money through the game. Other games have features like loot boxes, which are randomized upgrade kits that players must purchase keys to open. A 2018 Australian study concluded that loot boxes, which make up a large proportion of the gaming industry’s revenue, are similar psychologically to gambling. In the Gulf Islands, the program is coordinated by David Nickoli, who is based on Pender Island. Clinical work is referred to Victoria, but prevention and education work in the islands is done by Nickoli. Though 3.5 per cent of people does not sound like much, provincially it adds up to around 125,000 individuals. Serzisko and Nickoli both hope to get the word out about the program. Services offered are not just clinical and are available to anyone who is affected by problem gambling. One of the biggest challenges the BCRPGP faces is addressing the stigma attached to gambling problems. People tend to avoid talking about problem gambling, Nickoli explained, and discussion is the only way for the problem to come to light. Those interested in the program’s services can call the B.C. Gam Info Line at 1-888-795-6111, which will connect them with the outreach counselling provider in their area. For more on this story, see the Jan. 23, 2019 issue of the Gulf Islands Driftwood newspaper, or subscribe online.